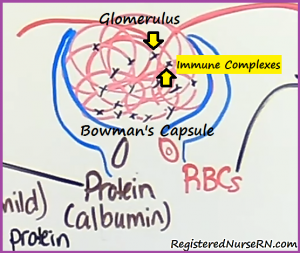 This NCLEX review will discuss nephrotic syndrome vs glomerulonephritis. As a nursing student, you must be familiar with nephrotic syndrome and acute glomerulonephritis along with how to care for patients who are experiencing these conditions. Don’t forget to take the nephrotic syndrome vs glomerulonephritis quiz. Changes to the glomerulus of the nephron that leads to the leakage of a MASSIVE AMOUNT OF PROTEINS into the urine. Other causes can be secondary due to a disease causing changes to the glomeruli, such as lupus, diabetes, heart failure, etc. Main protein lost is ALBUMIN…can also lose immunoglobulins that help fight infection and proteins that decrease clot formation. Assess for blood clots: deep vein thrombosis, respiratory change pulmonary embolism etc. Inflammation of the glomerulus that leads to the leaking of RED BLOOD CELLS and PROTEIN (mild) into the urine. Understanding how it works: AGN is not caused from the strep bacteria attacking the glomerulus but the immune system’s response to the bacteria by creating antigen-antibody complexes, which inflames the glomerulus. This is why you see it AFTER a strep infection. Monitor blood pressure (antihypertensive medications) and diuretics may be ordered by the physician. Diet limiting sodium and fluid…if oliguria presents will need to limit potassium-rich foods as well. Relapse not common but teach how to monitor for strep infections in the future and the importance of obtaining throat/skin cultures.